• Audition technique - finding monologues & sides that perfectly represent you! If you're interested in finding out how I can make a difference for YOUR career, let's set up a free consultation. I can work with anyone no matter where you live, as long as they have a phone or an internet connection! Email me now! 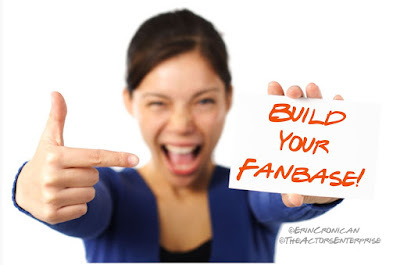 I was reading a recent article by casting director, Mark Sikes, wherein he discusses "building your fanbase." In this article, he is speaking about the industry leaders (agents, casting directors, producers, etc) who are in the position to get you working. We've all been taught, over and over, the concept of keeping in touch with industry folks and maintaining the relationships. Very few actors admit to doing this regularly, but we are still aware that it is an important part of our day to day marketing efforts. But I want to expand the conversation a bit... how do you keep in touch with your OTHER fans? That is to say, how do you maintain your relationships with the folks that will buy tickets to your shows and show up to the movie theater? Today, I want to talk about this concept of BUILDING AN AUDIENCE. Harrison Ford once said, "I'm an assistant storyteller. It's like being a waiter or a gas-station attendant, but I'm waiting on six million people a week, if I'm lucky." This has always inspired me to remember that the people who really count are the ones who pay for a ticket to watch me perform. And it's no wonder - Harrison is talking about 6 million folks per week! So wouldn't it make sense to build up a REAL fanbase of audience members, and make that your selling point to the industry? So, how does an actor build an audience? First: You need to be accessible, 24/7. This means: create a website, and join some of the social networking platforms where your fans are likely to be. Facebook, Twitter, and Instagram are all great places to build relationships with every day audiences. And, if you have a hankering for writing- start a blog! Second: You need to be willing to spill the beans! Talk about your triumphs. Express your enthusiasm for the business. Create a buzz about your career that makes people want to follow your success. And, in return, support other people's work and herald that as well. The more you involve others in your progress, the more people will feel a part of your career and will champion you as you move forward. Third: Do good work. I cannot emphasize this enough. You need to be a performer who is worth following. 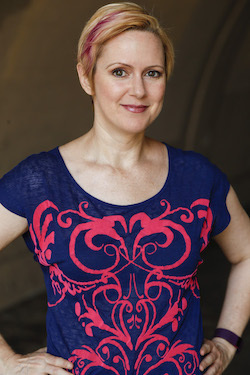 As casting director, Bonnie Gillespie, says, “Get better. Be more talented.” Be at the top of your game. If you aren’t the best at what you do, go get some training until you are. Spend every opportunity you can strengthening your skills, honing your craft, and developing your talent. 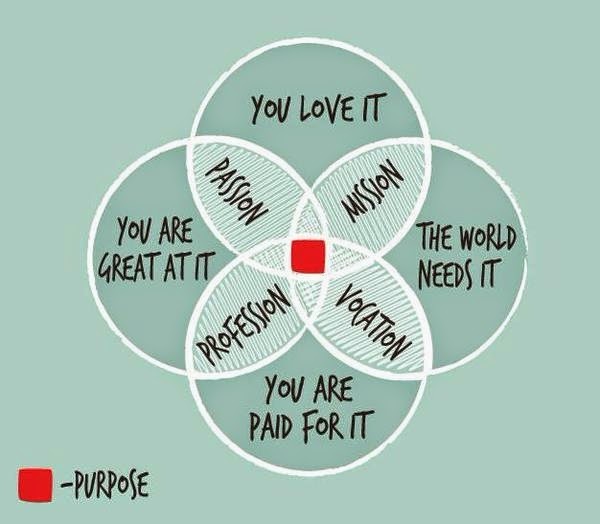 If you adopt these three things, you will be well on your way to developing an audience, which will go a long way in developing a long-standing career. So, don't just stand there. Do it! And... report back to me on how it’s working out for you! 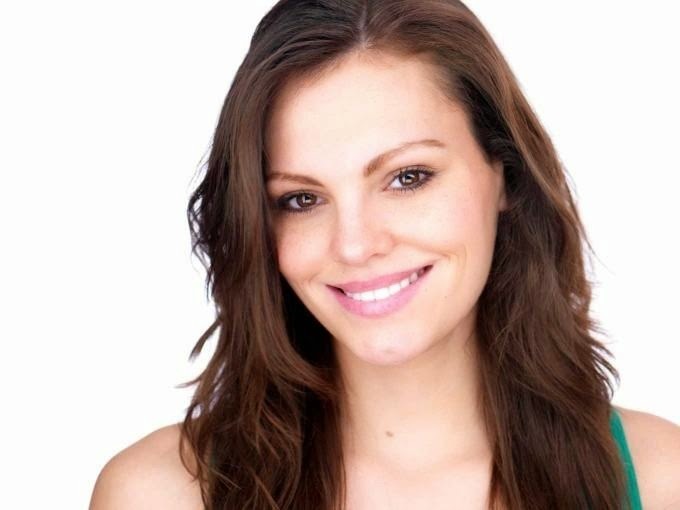 I'm very excited to welcome Lianne Robertson to this blog to write a guest post about an incredible event for actors that she's spearheading, called the Actors Pro Expo. I first got involved with the event last year, when I "live-tweeted" from the Expo floor and from a few workshops on behalf of the NY Actors Tweetup (for which I'm a co-founder!) I have been to many trade shows, and this one really had a warm vibe and had great opportunities for the actors who attended. And of course this makes sense, because the event has been designed and created by actors! I'm especially impressed by the seminars and workshops that Lianne has put together. Love musicals? Check out the seminars with Jay Binder (Binder Casting) and Justin Huff (Tesley & Co Casting). Want on-camera work? Take these incredible workshops on Dramatic Improvisation and Audition Technique. Each seminars & workshop is only $30 - totally affordable for an actor on a budget. I've invited Lianne to say a little bit about what makes this event special, and to encourage you to join me in New York City on April 18 - it's going to be an amazing time! "The acting industry can sometimes be a tricky place to navigate, there are so many different components that you need to take into consideration when growing yourself as a business! You’ve got to get your headshots, make your website, organize your taxes, find an agent, find a flexible job that will support your sporadic audition-based lifestyle, try to find said auditions and above all get your name out there to casting directors! Sheesh, what a balancing act! But what if we told you that there’s a place you can go which has all the information and advice on every one of these components? Don’t believe us? 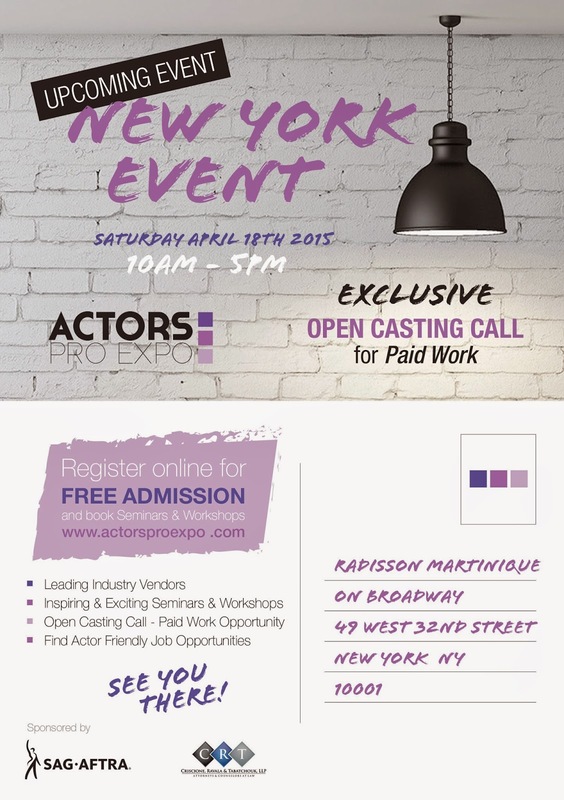 Then come along to Actors Pro Expo on April 18th and see for yourself! Actors Pro Expo is an event designed by actors for actors with our fundamental goal being to help you create opportunities to develop and sustain your career. We have over 25 vendors from every sector of the industry to give you the most complete advice possible; it really is the ultimate Actors Tool Kit. Guerrilla Photography will be there to offer headshot assistance, eStage for all your website needs, Bambridge for all your taxation questions, The Actors Project to help you land an agent, Mustard Lane, FSS and Atrium to help you find a flexible part-time job and Backstage, actors access, Casting Networks Inc and CastingAbout to ensure you have all the info on the latest castings and how to apply. 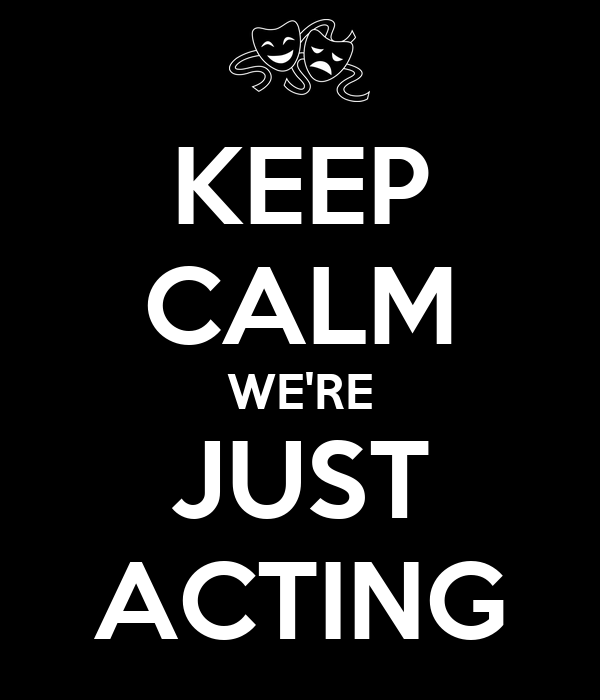 We’ve also got The New York Conservatory for Dramatic Arts, Stellar Adler Studio of Acting, Playing With Reality, The Accent Kit, Scott Powers Studios, Methuen Drama, Roger Hendricks Simon Studio, Art & Soul Acting, David Brunetti, Broadway Dance Centre, Play by Play, The Actors Enterprise and Studio 4 to ensure your acting skills remain top notch and to give you ongoing advice and training after the event. Finally SAG-AFTRA as well as Criscione, Ravala & Tabatchouk, LLP will be there to offer any legal advice you require. Aside from all these incredible vendors, Actors Pro Expo will also be hosting an OPEN CASTING for director Rob Margolies next project a ‘SAG-AFTRA new media agreement’ Web Series! Registration opens at 10am and is first come, first served so arrive in plenty of time to secure your slot! There will also be ongoing seminars and workshops on throughout the day held by Casting Directors and other industry professionals so you can get in-depth information on specific aspects of the industry that you want to know more about. Finally, in terms of helping you get your name out to Casting Directors, we will be offering Casting Director Dropboxes. Simply print out your resume and pop it in one or all of the boxes. Each CD will then review their box after the event and who knows, you may be getting a phone call! 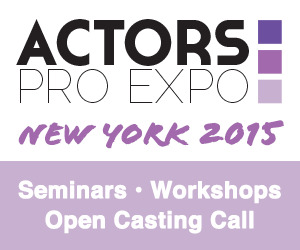 Overall Actors Pro Expo is here to help you build, grow and brand yourself as a business. Oh and did we mention, it’s FREE?! You can register here for your free entrye-ticket and to book some seminars & workshops. We can’t wait to see you at the event! The Actors Pro Expo Team"